*It is known* that I’m not the biggest fan of contemporary YA fiction around here. Actually, that’s kind of an understatement. Until recently I pretty much avoided this sub-genre like the annoying popular clique at my high school. Rolling my eyes as mentions of it passed me by on twitter, and scurrying down back alleys of blogs once I realized they dominated a particular post. However, I must admit I’m now among the converted, at least when it comes to anything by Rainbow Rowell. Rowell’s Fangirl was just so satisfying, I found myself voraciously devouring its pages, savoring chapters as if they were a secret stash of chocolate. The story follows a young woman, Cath, whose life is completely shaken up when she starts college and is forced to reconcile her fan fiction world with the realm of college drama. Simon Snow (a clever representation of Harry Potter) is Cath’s everything, and it’s addictive following her slash fiction in addition to the events of Cath’s own life. She has a twin sister, Wren, who used to be completely on board her fan fiction obsessed life, but who’s struggling to find herself once they reach college. They’re both concerned with the well being of their Dad who comes unhinged from reality at times, and are finding their independent ways to cope with the sudden reappearance of their absentee mother. The book takes us in to Cath’s head as she navigates the shift in her creative life, while tackling adulthood head-on. Delightful, all too real, scenes of Freshman year dorm life had me opening the kitchen cupboard to cradle my ancient blue Starbucks mug, which I pretty much ate all of my meals from in college and which saw me through many social debacles. When a book is really, really satiating, just great, it’s hard to put your finger on what all the magical elements were, that came together to make this happen. I think that’s what’s special about truly fantastic reads; you can break down their parts to try and track their origins, but in the end it comes down to simple chemistry and the synergy of all the moving parts sparking. Perhaps I loved this story so much because it’s ultimately the tale of a young writer learning to find her voice, and that was moving enough without a lush historical setting or the addition of fantasy elements. 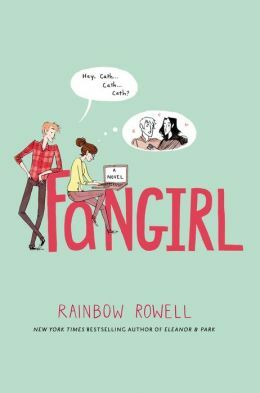 Like Cath who learns to reach outside of herself and the world of Simon Snow, reading Fangirl, taught me to look outside my favorite, comfort genres and that it’s okay to turn to the contemporary world for inspiration. Game, set, match to Rainbow Rowell.